Today, on one of the facebook groups that I run, a member asked what feels to me like the quintessential limit-setting and respectful discipline question. It was a long and complex question with many parts, especially as it contained examples, which I had specifically requested (it is so much easier to answer discipline questions when there are examples!). As soon as I read it, I realized that the answer was similarly long and complex with many parts, and much better suited for a blog post than for a comment on a facebook discussion thread. I also realized, very quickly, that this question was one that so many parents struggle with. So, with this reader’s permission, I am copying her question here…and answering it here. It is a great treat for me to be able to respond to a question here, taking it apart and answering all of its pieces. I love using real-life and current examples, as they are often highly relatable for all of us, and the answers, rather than being philosophical or generic, can be very specific and hands-on…just the tools that many parents are looking for. Please, how do you deal with constant tuning out, running away and laughing in a really annoying way when you try to set a limit? My son is 4y3mo and until today he often requires that we call him many times and often have to go touch him on his shoulders saying “hey, i am talking to you” – when we ask him questions (about his day, or whatever) or try to set a limit. This happens sometimes also when a friend his age talks to him in a moment when he is transitioning (for example, arriving at Kindergarten when he is not in very good mood). It is worse when we are setting a limit (time to do chores or end a play…). And recently he has been engaging in some sort of play in Kindergarten in that he and one or two of his friends find very funny to use “toilets words”, or offend one another (“hey you pee man”) – sometimes also irritating other children who are playing quietly. He laughs in a really defiant way when we require him to stop. I am getting concerned. There is this pleasure in doing “wrong” things – not washing his hands after toilet, for example, and laughing, tuning out and running away when I insist that he does what is right. Today this washing hands episode ended in crying, after i had to wash his hands for the second time, since he, laughing, told me “i will make them dirty again” and rubbed them against the toilet floor right after i had washed them against his will. Indeed on the first months of this year, he, who tends to be a reluctant/restrained boy and needs preparation for new situations and changes, was really unhappy at Kindergarten because his best friend would always be missing. He didn´t want to play, he didn´t want to take part in anything. After some months he learned from other children this pretend-gun play, which helped him work through many fears, and till today he plays it against his internal monsters (he shoots wolves, bears and “bad men”). Of course he shoots me as well when i try to set a limit, which is a reason for major stress. Since he turned 4, he has found new friends, enjoys kindergarten, is taking part in the proposed activities and play, but is, on the other hand, more and more sassy and insolent. Then two days ago, he and his friend purposefully destroyed a new toy in school. That resulted in many conversations (at school and at home) and resolved today, after he gave one of his trucks to the Kindergarten as a replacement. This made me really upset. I fear that my child will turn into a bully. He is a lovely boy in his interactions with most children, but there are some settings, which he “revisits” at home with me, in which he plays the insolent funny sassy boy. I am having some problems in dealing with it. It’s right there in the first sentence ( I will say up front that, to my knowledge, the writer is a person for whom English is not a first language, so I don’ t want to get unnecessarily pedantic….nevertheless, there are always things to learn from words). No, not the “running away” part, and not the “tuning out” part. Not even the laughing part (which I know pushes a lot of buttons). Yes, those are all important. But if I could highlight one set of words in that first paragraph, it would be “a really annoying way”. And then of course, there’s the word “trying”, used in the phrase “trying to set a limit.” So let’s look at those two first. You know, they say that face-to-face is much better for learning about limit setting–and second to that, speaking with one another. But sometimes, I find that writing is just the thing…mostly because we reveal ourselves our writing in a way that we have gradually learned not to do in our interactions or our speech. That’s why those two phrases are so important to me. Throughout this earnest question, there is a theme: Why is this child, this “lovely” boy, doing these intentionally “wrong” things? And here in this first paragraph we find it. He’s four, and that’s what four year olds do. It is annoying to adults, which is fun. Really annoying, which is really fun. There’s your answer. No, they’re not malicious. They don’t exactly do it because it’s annoying. They’re not out to get us, or wanting to upset us. They’re doing it because they are exploring and testing the power that they increasingly possess. And when we are annoyed–or rattled–or upset–or agitated–that is both a powerful and a frightening feeling for our children. They feel powerful because they realize that they have control over our emotions–they can “make” us annoyed. And they feel frightened and insecure for exactly the same reason–if the big people who you count on so completely to be strong, dependable, and in control, are really so easy to influence or knock off balance, what does that say about their ability to care for you? And in turn, like a notch on a gear, comes the predictable response….more and more testing to try to see exactly how strong and in charge our leaders actually are. Yup. It’s always about us. Bummer. I know. When we can cease to be annoyed (which I know is easier said than done), challenging behavior loses much of its appeal and usefulness. So yeah, that part is within our control. We have to not care. We have to be unflappable. We have to be unphased by their attempts to knock us off balance. It’s what they want. It’s what they need. And it’s what we need, too. And then there’s that second part…when we are “trying” to set a limit. There is no trying in limit setting. Yeah. Just like there’s no crying in baseball. There’s no trying in limit setting. We are either setting firm and clear limits, or we’re not. If we give of an air of “trying” (which we do, when we’re unsure…and remember, children are omnisicient and can smell a single drop of hesitance a mile away), the same thing happens. Uh-oh. The people in charge aren’t sure what they’re doing. If they’re not sure what they’re doing–the people who know everything–then how am I supposed to know what I’m doing? I mean, sure, in a real sense, of course there’s trying–there’s trying new strategies, trying new wording, trying to be confident. Of course. Nobody’s perfect. But if we have a pervasive sense that we’re trying to set limits, we probably feel disempowered or ineffectual. And the thing is–once again–our kids know that. And so the limits don’t work…because limits need “oomph” and utter confidence behind them. But let’s get back to the behaviors for a minute. Oh yeah. We were going to start at the beginning. You know how I get. So. Tuning out, running away, and laughing. 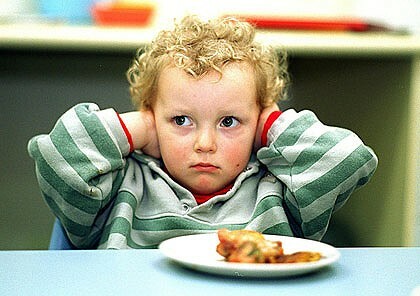 Three of the most frustrating–and most common–behaviors of preschoolers. The question was “how do you deal” with these behaviors. You make the first two either highly unlikely or impossible and you let the third one go. But first, you ask yourself these questions: When you are asking these questions of them, or making these requests or demands, or setting these limits, where is your body in relation to theirs? Are you speaking from your full height downward to their full height? Are you across the room? In another room? Are you calling out the requests? If the answer to any of these questions is “yes”, that’s why they’re not working. In order to gain children’s cooperation–because cooperation is what we’re after, not obedience–we must connect with them first. Without connection, there is no cooperation. If you want a preschooler’s cooperation, the most reliable way to get it is to walk over to them, get down on their level, wait respectfully whenever possible for a break in what they are doing so that you aren’t interrupting them unnecessarily, make some sort of physical contact, acknowledge what they’re doing, and make your request in a calm, unflustered way. You wait for their attention, so the tuning out isn’t a problem. You’re very close, so if they start to run away, you’re right there, and you can physically stop them. Yes, every time. It won’t be quite like this forever–they will grow and change, as will you. But right now, this is the way to gain cooperation from young children. Of course, it’s not always possible–we’re busy people. And that’s okay. Just know that when you can’t do it, you are likely to have a relatively poor success rate at gaining cooperation–so at least you know not to be surprised. Yes. This is absolutely typical. And of course it’s worse when you want him to stop something fun and do something that is important to you–why would we expect them to be happy about such a transition? And yet, I feel the need to make a critical correction. No child “requires that we call them many times.” That is something we choose, and something that we must take responsibility for. If we allow it, if we create that dynamic, that’s our decision, not theirs. When a parent tells me that they have to ask more than once or twice, I see a parent that has taught their child that listening is optional. Here’s what you need to know. Young children, for the most part, do not respond to verbal commands. They need presence, they need connection, they need physical contact (what’s the matter with needing a touch on the shoulder? It sounds lovely!) in order to “hear” what you are saying to them. So if you have something you really need them to hear, you satisfy those age-appropriate requirements…and if they are not responding to you by the second–or over time, the first–time, then you move on to the next stage of limit setting. You do not repeat yourself. It teaches them not to listen, and it frustrates you–there’s nothing useful in there. And oh, yes. The “toilet words”. Almost all kids go through that stage. By far, the most fun part of toilet words is that they drive adults crazy. So by now, you know what to do about that. Tune out. Let them be. It’s perfectly normal. Especially if they’re doing it with peers, rather than with you. It’s a four year old’s version of a joke, of playing with words, of experimenting with freaking people out. They think it’s hilarious. I advise ignoring it entirely. If it really starts to make you crazy, set a limit that they can take it into a different room (some people say toilet words are for the bathroom–personally, I don’t care for that strategy, it feels very disrespectful to me.) Or, if the words are directed at you, it’s a great opportunity for playful solutions. It throws kids off guard, makes them laugh, and takes all the power and energy out of those words. When my child says “You’re a poopyhead!”, I say (very playfully) “Oh yeah? Oh yeah? Well, you’re a schmoopyhead!” When they walk around singing “poop poop poop”, I get highly dramatic and sing an operatic tune, using the word poop at every opportunity, which usually provokes peals of laughter. These are loaded words, meant to generate a big reaction–when they don’t get that reaction, they lose appeal. I wouldn’t worry about them using these words in play with other children–even if they are disturbing other children. Four year olds can handle their own interactions–if the other children don’t like it, they can and will speak up. He laughs in a really defiant way when we require him to stop. I am getting concerned…There is this pleasure in doing “wrong” things – not washing his hands after toilet, for example, and laughing, tuning out and running away when I insist that he does what is right. Today this washing hands episode ended in crying, after i had to wash his hands for the second time, since he, laughing, told me “i will make them dirty again” and rubbed them against the toilet floor right after i had washed them against his will. Yes. This is a beautiful description of a child at a stage of life in which he wants to make it clear that he is older now and he wants to make his own decisions. He wants more autonomy, and at four years old, he deserves it. This is perhaps one of the most challenging lessons of parenthood: control is an illusion. He’s letting you know that, in case you forgot. Yes, he laughs in a defiant way when you try to get him to stop using certain words…because he knows with all of his heart and soul and mind that he, and he alone, has 100% control over what comes out of his mouth. Not you. Not me. We can’t “make” our children say or not say anything. He knows that. Sometimes we, as parents, forget, thinking we have more control than we do. So they remind us. Ha, ha, ha, there is absolutely nothing you can do about what comes out of my mouth…and if you don’t get that, I will prove it to you. The harder you try to make me stop, the more I’m going to do it. Because I can. And you can’t control that. The only thing we can do, as parents, about what children say, is to 1) nurture connected, empathic relationships with our children, so that they feel concern when we are genuinely distressed about a behavior, and 2) not react to their words, so as to give them undue power. That’s it. The rest is all them. I don’t want to wash my hands right now. I’m not ready. I was busy. I don’t care if my hands are clean. You’re rushing me. You’re telling me i have to wash my hands, that it’s important.. I disagree. You silly mom, you think you have control over whether my hands are clean or not. You don’t. I do. You can wash my hands 10 times and then I can rub them on the floor, or stick my fingers in my nose or down my pants, or run outside and stick them in the dirt or lie down on the floor and stick my hands under the couch and get them dirty again. This is something you think you have control over, but I am four, and I have control over my body. Don’t misunderstand me. There are times when we do need children to wash their hands. If we cultivate connection and respectful cooperation (in all things), approach them closely and with respect, wait for them to be ready, offer them choices (which gives them appropriate levels of power and decision making), explain what needs to be done, and give them time to come to it on their own, they will begin to take responsibility for these tasks themselves, without argument, power struggle, or even reminders. Isn’t that what we’re after? Independent self-care and bodily autonomy rather than simple obedience? Well, it’s what I’m after, anyway. So. You want him to wash his hands. You decide whether it’s critical right now–if not, let it go. If he’s engaged in play, you walk over to him, you get down on his level, and you wait for a good moment to interrupt. You say “In a few minutes, it’s going to be time to clean up the toys and then I’ll need you to wash your hands for lunch.” Then you wait and let him wind down his play at his own speed (within reason). When those few minutes are past, you again come close, and touch him on the arm, and say “It’s time for lunch. Let’s put away these toys together (or maybe in your home, they can stay out until later). I need you to wash your hands before eating. Would you like to go wash them by yourself or would you like my help?” (or alternatively “would you like to wash your hands in the bathroom sink or the kitchen sink?” or even “would you like to wash your hands in the sink or would you like to use a wet washcloth?”) And then you stay with him, you follow through. When you get to the sink and he refuses, you stay close, and you calmly repeat “I need you to wash your hands before eating lunch. Would you like to do it yourself or would you like me to help?” If he refuses or says “neither”, I would say, completely unflustered, “I hear that you’re not ready. That’s okay, I’ll wait” or “I’m going to go have my lunch. When you’re ready, you can wash your hands and come join me for lunch”…and walk out. This is an area in which we can give our children some power and control. If we give our preschoolers power and control in places that they can have it, they will not demand that power and control in as many other situations. Dear Mom: He’s not a bully. He’s four. I don’t even see anything remotely resembling bullying in the description. I see no cruelty toward another. And that being said, actually, it’s not really possible for a four year old to bully anyone–they can be aggressive, yes, but aggression is not bullying, and we do a disservice to those who are genuinely bullied when we use that term to describe all challenging behavior, including that which is entirely developmentally appropriate and expected, as all of these behaviors are. He broke a toy. Kids do that sometimes. It is the job of teachers to observe and notice and intervene before equipment is destroyed. It’s not acceptable behavior, but neither is it particularly concerning. Whew. I told you there was a lot in there. So one last word to the naysayers, to those who feel that children should, indeed, be obedient, and should do what we ask the first time we say it. To that, let me say that I hear you—and that we disagree philosophically. And perhaps most importantly, that there is a price to be paid–in behavior and in the longer run–for choosing obedience over cooperation. The research on this is robust. I’m not under the illusion that I can convince everyone. I hear you that you want to shout “go wash your hands” from the other room and have your four year old jump up from what he’s doing and run in and go wash his hands. There will be a few very easy-going children who will do this of their own accord. For the rest, it’s simply an inappropriate expectation. It is the job of a four year old to test limits. It is our job to understand how a four year old operates, be confident and prudent in setting limits, and use the combination of the two to build cooperation and connection in the interest of their goals and ours. This entry was posted in challenging behavior, communication, discipline, preschoolers, respectful caregiving, triggers, Uncategorized, young children and tagged autonomy, bully, cooperation, defiance, discipline, limit setting, respectful discipline. Bookmark the permalink. I really, really, really liked this blog post. It is full of great advice for parents and caregivers. I am sharing it with my networks, and I thank you for this clearly-written, easy-to-understand post explaining the “whys” and “hows”. A couple questions: 1) which Facebook group is this? I’m interested in joining. 2) When you say, “the research on this is robust,” can you provide examples of this research? I have a partner who does not believe me about the “hows” and “whys,” and I struggle a lot with getting my points across. Thanks for asking. That’s what I get for working into the wee hours of the night–I forget to put the links into the post. WIll be fixing that later today. For now, there are two facebook pages that might be of interest to you–they are both closed groups, so you have to request to be added. They are here: https://www.facebook.com/groups/visiblechild/ and https://www.facebook.com/groups/whatdoisaykids/. And yes, I will post research links on the post in a bit. Thanks for the follow up! As usual, Robin, you offer guidance and sound common sense about building better relationships with our kids. Offering that power to our kids, when we can do so safely, treats them as people, builds trust and independence. It can be hard in the tough moments to stay calm and unflappable but you’re so right, it is what our kids need. You are such a great resource to all of us, thank you. Robin, Thank you, very insightful! One question. You speak about moving on to the next stage of limit setting when they don’t respond despite parents being age appropriate. And then you write you don’t repeat yourself. But how is that setting a limit? Basically I stop making a request that I thought was appropriate. Can you elaborate on that? When I say I don’t repeat myself, I mean that I go to them and connect with them before hand so that I am certain that they heard me the first time. I don’t repeat myself because I don’t need to. Does that help? I have a question about the suggestion to be unflappable. This is very in keeping with my natural personality, almost to the extent that I wonder if it’s healthy. I did not grow up with a family that expressed strong emotions, particularly negative ones. How do you make sure you are unflappable but still nurturing? Is there some point at which NOT responding to a child’s emotional reality feels like absence or even denial of that reality? I ask because, tho i had a SAHM, she often felt absent from my emotional realm as a child, and I think her emotional response to me made my emotional world feel illegitimate. She was calm, but almost to a fault. When I see the difference between how I react to my son’s 3yo) behaviors when they annoy or frustrate (me: patient, non reactionary, calm, unbothered, or can at least appear to be) and how my husband reacts (much more reactionary, shorter tempered & emotionally expressive when it comes to anger than me, but on the spectrum of normal) I feel that he is being more authentic than I am, in a way. My Zen is almost a mask I wear (though it is rare that I do even FEEL angry), and at some points it feels that being the calm implacable source of strength for my child is a dishonest or inauthentic representation of myself and/or how a person manages his/her emotions. If I am modeling emotional processing & integration for my child by how I express myself and engage, doesn’t unflappability encourage a certain denial or suppression of emotion? I recognize small children are not the ones to bear the weight of the adult’s emotional realities; that isn’t appropriate. But I wonder what the balance is between emotional availability and authenticity and being that source of immoveable strength for one’s child. We each have to find that balance for ourselves. I do not see “unflappability” at all times as an admirable goal. I see authenticity and accountability as more appropriate aims.